I love cheese. There’s no denying it. It’s a close second to my love of carbs. Even better if you bring carbs AND cheese together. That’s death row meal material. I can’t believe it’s taken me this long to check out The Stinking Bishops given my love affair with cheese. Anyway, I’m finally here and it doesn’t disappoint. Cheese and meat selections are displayed on the blackboard with flags notifying their origin and small animal symbols to identify whether it’s a cow’s milk, sheep’s milk or goat’s milk kinda cheese. We ask for recommendations for our cheese board with four varieties – one from each category (white mould, hard/semi-hard, washed rind, blue mould). The Brillat-Savarin is a no-brainer, beguilingly creamy and luscious. I had tried the Tete de Moine before and enjoy it for its uniqueness. Although it’s probably not everyone’s cup of tea – it’s sharp and bold in flavor. The one of a kind cheese is thinly shaved into elegant, thin rosettes using a Girolle. A wedge of Roquefort is a classic addition and Epoisses is always a fave of mine. The meat board I’m less interested in, but we opt for the truffle salami, nduja, prosciutto, and cecina (to get some beef in there). 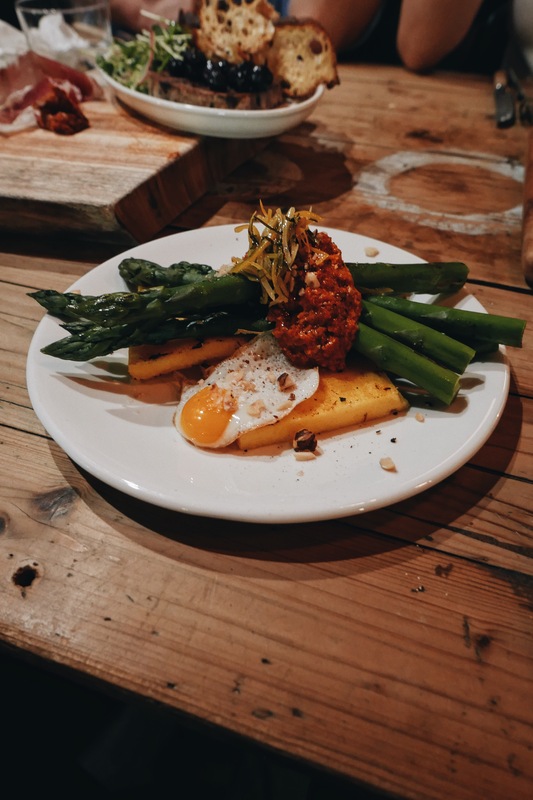 The nduja has a good spicy kick to it, so anyone avoiding heat may want to sidestep this one. But other than cheese and meat boards, we’re here to try some of the other dishes, too. 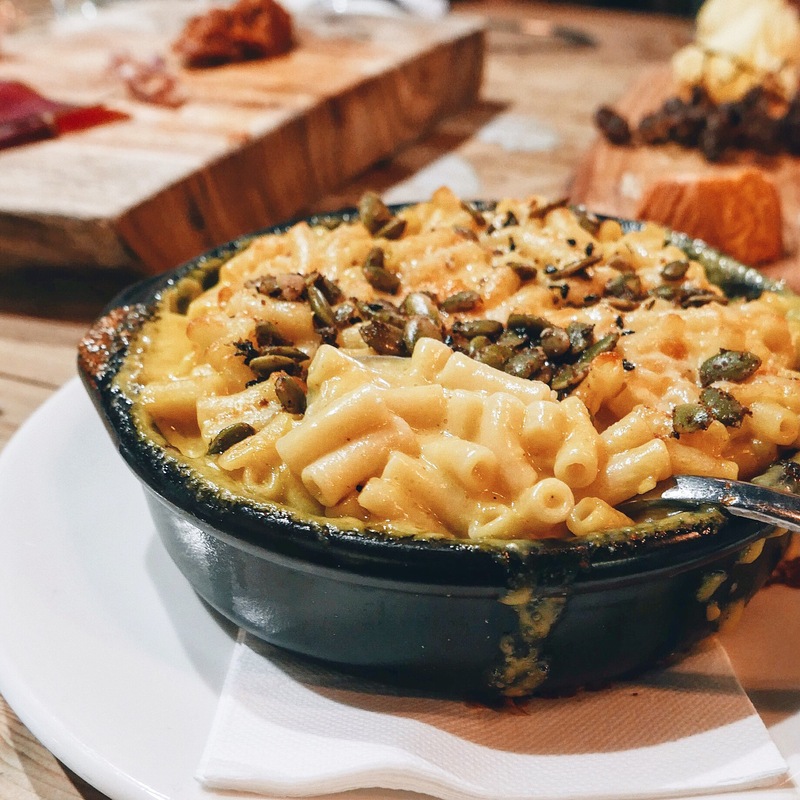 The Mac ’n’ Cheese ’n’ Pumpkins with scamorza, sage, pepitas, and dukkah is downright dreamy. Hitting home with all the good stuff, the creamy, cheesy macaroni is topped with crunchy pepitas and deepened with the spices in the dukkah. 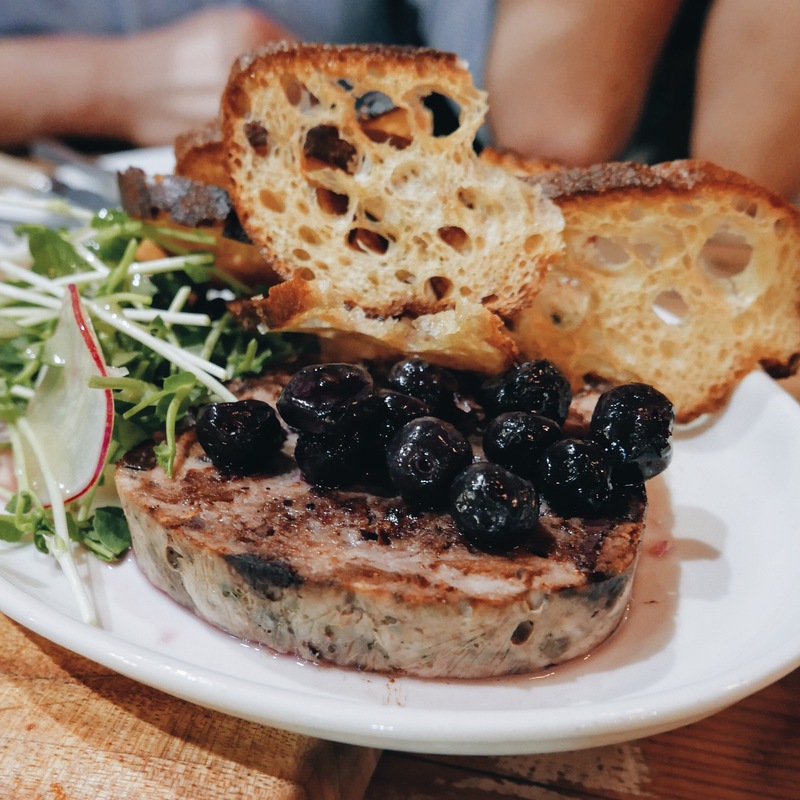 The chicken & duck terrine with blueberry and tarragon is a bit too chunky for me. 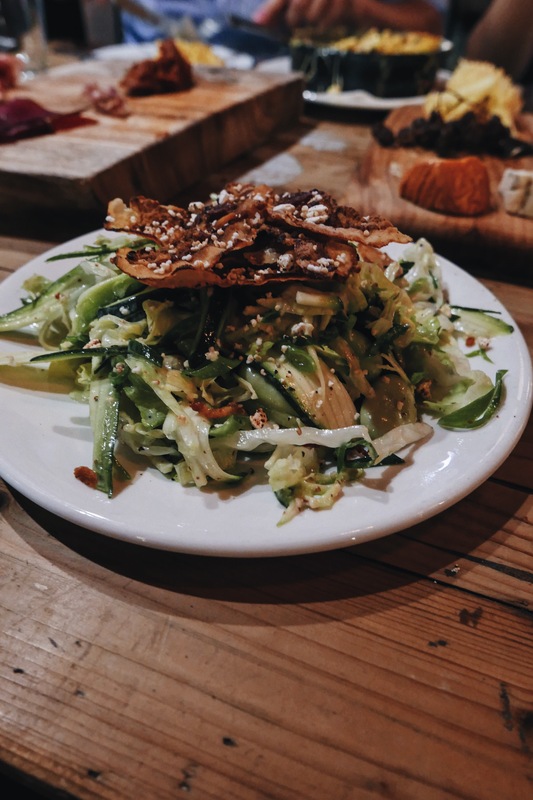 However, the zucchini & guanciale salad with broad beans, puffed grains, green shallot, buttermilk, and seeded mustard dressing is ace – I’m hooked on the delicious dressing. Not as enthralling is the roast asparagus with grilled polenta, spicy romesco, fried quails egg, and preserved lemons, which seems to be holding back in flavor. To round off our meal, we share the strawberries and cream on shortbread. argh i NEED that mac & cheese!